Is your computer unstable? There may be a problem with its RAM. 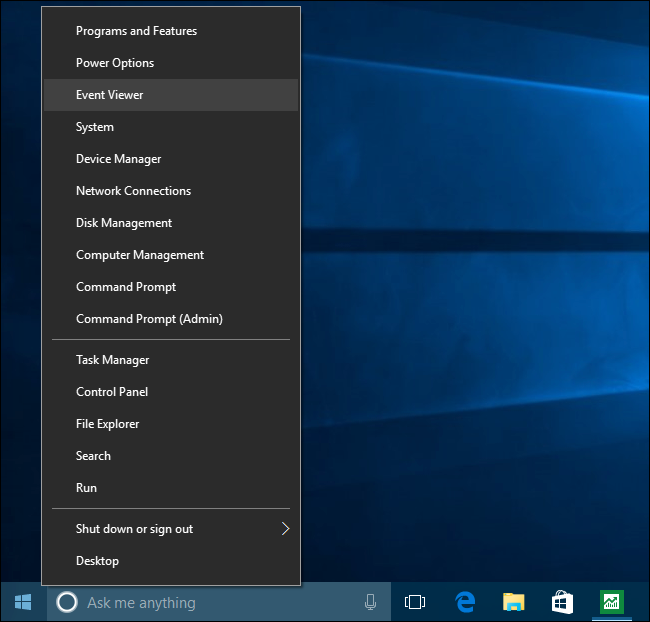 To check, you can either use a hidden system tool included with Windows or download and boot a more advanced tool. 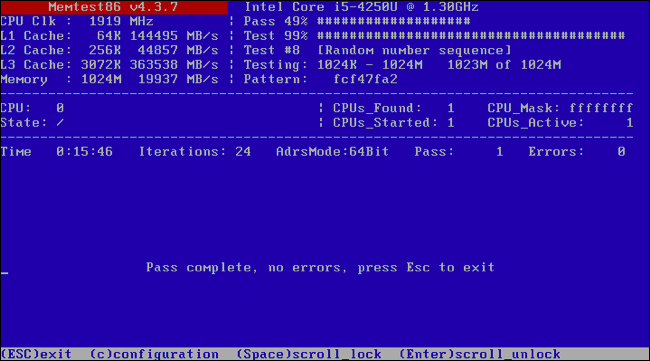 Both of the below tools function by writing data to each sector of your computer’s RAM and then reading it back in turn. If the tool reads a different value, this indicates that your RAM is faulty. 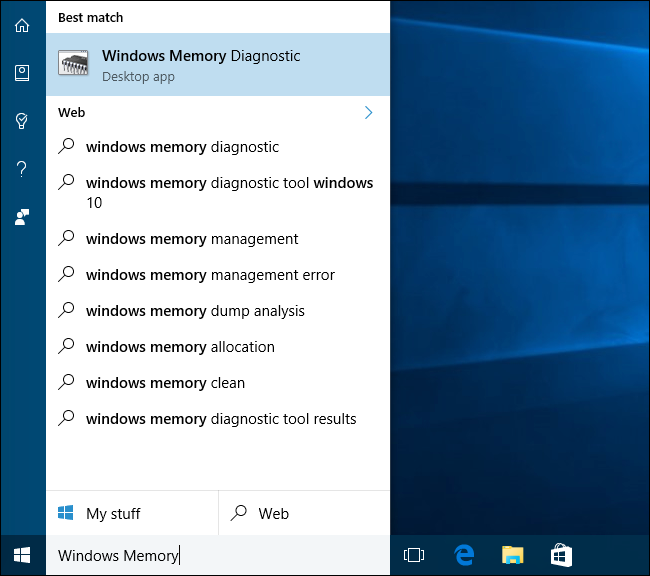 To launch the Windows Memory Diagnostic tool, open the Start menu, type “Windows Memory Diagnostic”, and press Enter. You can also press Windows Key + R, type “mdsched.exe” into the Run dialog that appears, and press Enter. You’ll need to reboot your computer to perform the test. While the test is happening, you won’t be able to use your computer. “Restart now and check for problems (recommended)”. Be sure to save your work first. Your computer will immediately restart. 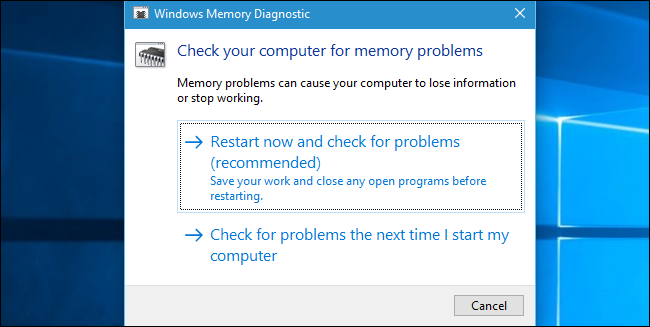 Your computer will restart and the Windows Memory Diagnostics Tool screen will appear. Just leave it be and let it perform the test. This may take several minutes. During this process, you’ll see a progress bar and a “Status” message will inform you if any problems have been detected during the process. However, you don’t need to watch the test–you can leave your computer alone and come back to see the results later. When it’s done, your computer will automatically reboot and return to the Windows desktop. After you log in, the test results will appear. At least, that’s what the tool says is supposed to happen. The results don’t automatically appear for Windows 7/10. But here’s how to find them, if Windows doesn’t show you. First, open the Event Viewer. 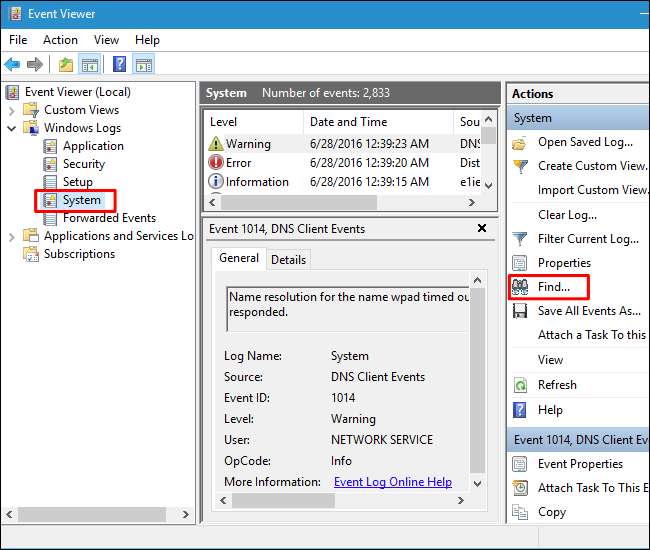 Right-click the Start button and select “Event Viewer”. If you’re using Windows 7, press Windows Key + R, type “eventvwr.msc” into the Run dialog, and press Enter. Navigate to Windows Logs > System. You’ll see a list of a large number of events. Click “Find” in the right pane. 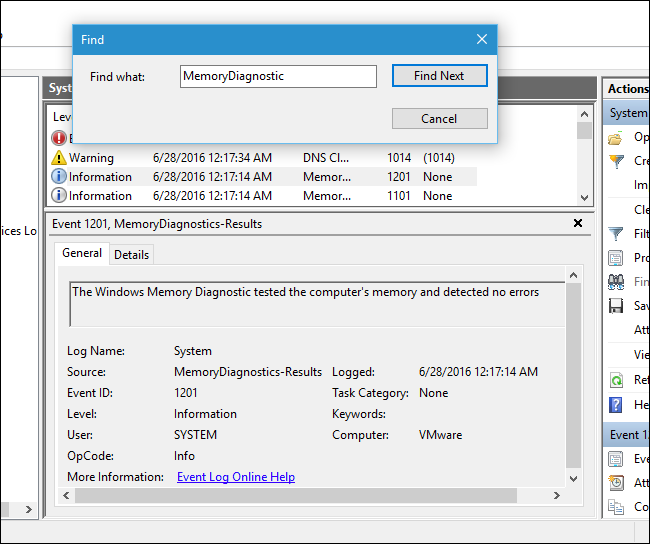 Type “MemoryDiagnostic” into the find box and click “Find Next”. You’ll see the result displayed at the bottom of the window. If you’re looking for a more powerful testing tool, you can download and use MemTest86. It performs a wider variety of tests and may find issues that the included Windows test won’t. The latest releases of this tool offer a paid version with more feature, although the free version should do everything you need. You don’t need to pay for anything. MemTest86 is signed by Microsoft, so it will work even on systems with Secure Boot enabled. 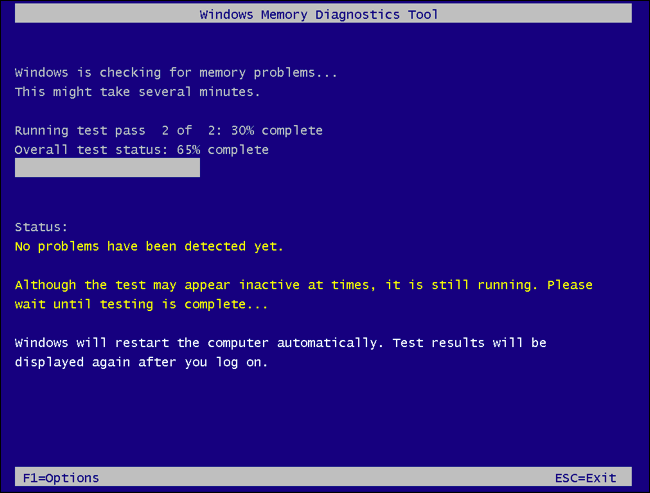 You could also try the free and open source MemTest86+. However, this tool doesn’t seem to be actively developed anymore. We saw reports that it didn’t work properly on some newer PCs. Both of these are bootable, self-contained tools. 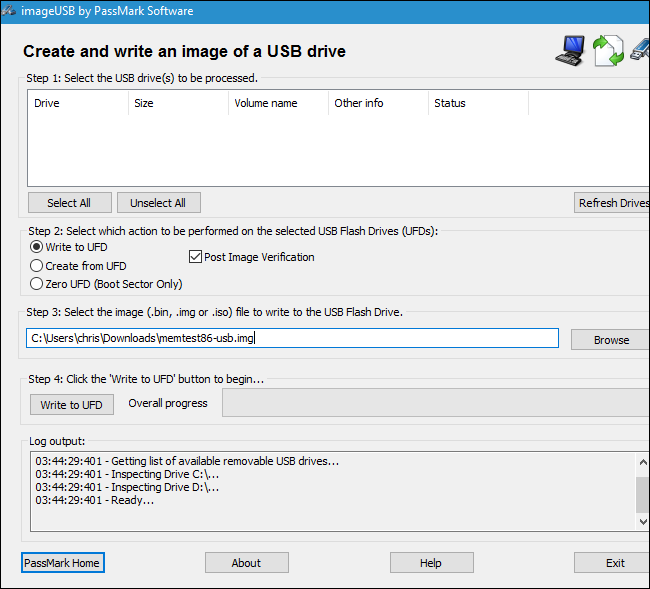 MemTest86 provides both an ISO image you can burn to a CD or DVD and a USB image you can copy to a USB drive. Just run the .exe file included with the download and provide a spare USB drive to create a bootable USB drive. This will erase the contents of the drive! Once you’ve created bootable media, restart your computer and have it boot from the USB drive or disc you copied the memory test tool to. The tool will boot and automatically start scanning your memory, running through test after test and informing you if it finds a problem. It will keep running tests until you choose to stop it, allowing you to test how the memory behaves over a longer period of time. Information about any errors will be displayed on your screen. When you’re done, you can just press the “Esc” key to exit it and restart your computer. If memory tests give you errors, it’s very possible that your RAM–at least one of the sticks–is faulty and needs to be replaced. However, it’s also possible that the RAM isn’t compatible with your motherboard for some reason. It’s also possible that your RAM can’t reliably run at its current speeds, so you may want to adjust your RAM speed to a lower setting in your UEFI or BIOS settings screen. After making a change, you can run the RAM test again to see if there’s a problem. This GEEK makes this more complicated than what it is. Windows, regardless of your OP System, does most of this stuff without your prompting..